Zucchini bread was a treat we had during the summer when I was growing up. Gardening often means a large bounty of vegetables, zucchini bread was one of my favorite ways to enjoy fresh zucchini during the summer. Growing up we had a huge garden, all of a sudden we would have an onslaught of zucchini. Zucchini bread was a sweet treat my Mother made during the summer. I loved the when zucchini was fresh from our garden. She served zucchini in bread, and then coated with cracker crumbs and fried. I never could decide which was my favorite way to enjoy zucchini bread. 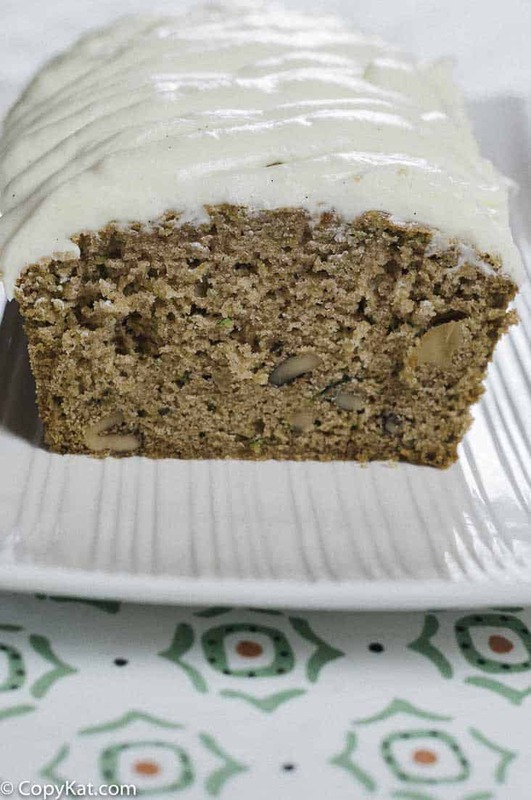 If you have never tried zucchini bread, you will find it is moist something like banana bread. Zucchini is very mild; it may be difficult to understand how a green vegetable tastes so fantastic, but it does. The bread is moist like banana bread; the flavors mostly come from the nuts, the sugar, and the cinnamon. So this bread makes a nice breakfast, it also makes for an excellent snack, or even goes with a cup of coffee. 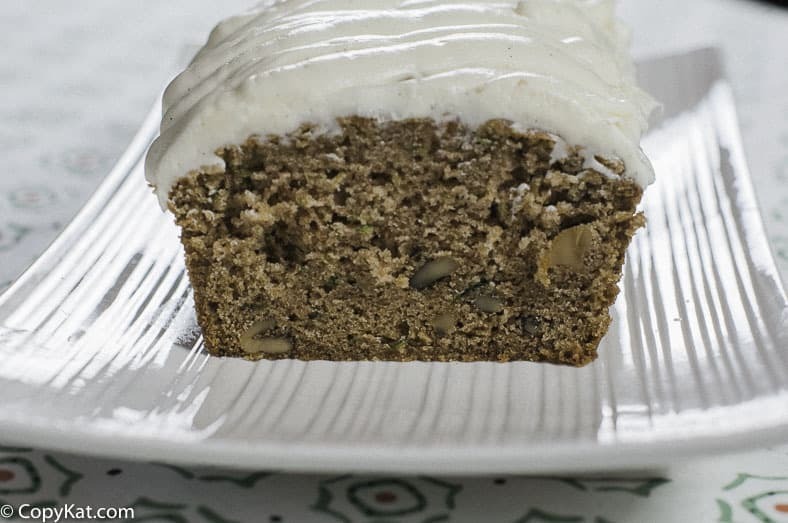 I like cream cheese frosting on my zucchini bread; it gives this bread more of a dessert flavor, but I promise this is something you will enjoy. If you enjoy zucchini, or your garden is overflowing with fresh zucchini here are some additional ideas for you. To make this recipe I like to use a box grater for my zucchini, then I like to wrap my zucchini with a paper towel and squeeze out as much of the water as I can. I then measure the zucchini. Sometimes zucchini can hold more water, by squeezing out the excess water I know I will get reliable results every time I make the bread. Zucchini Bread is the perfect way to use fresh zucchini. Grate zucchini with box grater. Place shredded zucchini in a paper towel, squeeze out the excess water. Then measure out the two cups of zucchini after the water has been removed. This should take almost 2 medium-sized zucchini. Sift together the flour, salt, baking powder, baking soda, and cinnamon. Cream together the eggs, vegetable oil, sugar, and vanilla with a mixer. Gently add in the sifted flour, salt, baking powder, baking soda, and cinnamon. Stir in zucchini and chopped walnuts. Prepare two loaf pans by spraying the pans with non-stick spray. Pour batter evenly between the two pans. Bake for approximately 40 to 50 minutes or until when a toothpick is inserted and comes out clean. Allow the bread to rest in the pans for about 10 minutes before allowing the bread fo finish cooling on a wire rack. Prepare the cream cheese frosting by combining the butter, and cream cheese with a mixer. Slowly add in the powdered sugar and vanilla. Spread the frosting over the zucchini bread. Once frosted this bread should be stored in the refrigerator. I love zucchini bread with a cup of coffee. Now we are all waiting to witness the great event of cricket tournament IPL Season 11 in April and May 2018. IPL seems the land of opportunities for the youngsters to showcase their talents and secure their positions in the national team. Stephanie your Olive Garden chicken scampi recipe is better than Olive Garden’s. What a fabulous tasting meal. My husband is the one that was doing the cooking and following the recipe. The only additional item he added to your recipe were mushrooms. Thank you so much it was fun duplicating something we have enjoyed for years and now know that we can make it ourselves. We will definitely try more of your recipe suggestions. Dumb question – do you remove the seeds before you grate the zucchini? no, unless you have over sized zucchini. Pick them when about 6″. Sue, this isn’t a dumb question, I have been wondering this for years. I haven’t had zucchini bread in along time. I need to make these soon! Thanks for the yummy recipe! This reminds me of my mom. She always makes this in the summer. So good! Cant wait for the garden to supply us with fresh veggies, including zucchini. just a drizzle of frosting? Oh my goodness this sounds delicious. It looks fabulous as well. Be over for coffee adn bread. Mm.. the cinnamon is a nice touch. Zucchini is an incredible ingredient and I love cooking/baking with it. My husband grills the extras with cheese!